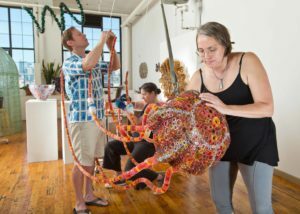 In Kait Rhoads’ Seattle studio, four people are making a jellyfish. Focusing intently, they thread glass circles onto long steel tentacles, weaving copper wire in and out to keep the circles in place. Even with light floating through the big windows and art and plants everywhere, it’s a tedious job. But the atmosphere’s upbeat. Rhoads’ helpers know they’re part of something big – a sculpture for the new Pacific Seas Aquarium that will inspire visitors for generations. Kait Rhoads working on a glass sculpture in her Seattle studio that will hang in the new Pacific Seas Aquarium. to a newcomer, manipulating the copper around a mosaic of orange, red and pink. 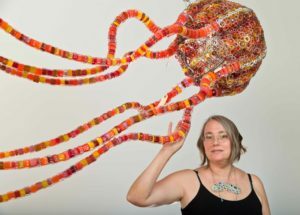 Rhoads invited friends around this weekend for a “Tentacular” – essentially, a work party to help make “Salish Nettles,” her sculpture of three giant glass jellyfish that will be installed August in the high atrium near the aquarium’s Baja Bay. Sculptor Kait Rhoads with one of her “Salish Nettles” glass jellyfish. Like most glass art, the jellies – a piece of public art paid for by the 1% for art mandated for all public works projects in Tacoma – have already involved a whole community of people. Rhoads supervised Museum of Glass hot shop crew and the teen glassblowers of Tacoma Hilltop Artists to create the cylinders, then a cold glass worker to cut them into cross-sections and a color specialist to order them. She consulted with PDZA jellyfish expert aquarist Dr. Chad Widmer, worked with a foundry to make the steel skeleton, and with engineers to calculate hanging points – each jellyfish will be suspended in a different direction. 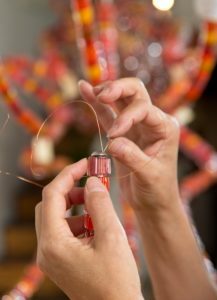 Kait Rhoads threads glass hexagons onto a steel “tentacle” with copper wire. And now, after weaving the jellyfish bells with more wire, she’s bringing in a crowd to finish off the 16 tentacles. It’s not quick – just three took five people around five hours for a total of 25 hours of work. But the result, says Rhoads, is an artwork that is beauty that everyone owns, just like the ocean that inspired the art in the first place. Find out more about Kait here.